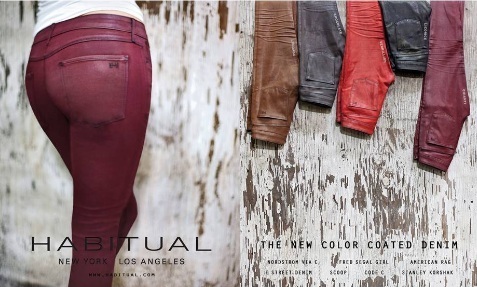 One of my must-haves for the fall/winter season is definitely a pair of Habitual color coated denim jeans. It has that legging fit (my favorite silhouette) that I love, that looks great whether you are wearing an ankle boot or long boot. This hand made denim jean is coated with a pigment that gives it a leather-look finish, while still maintaining softness, stretchability and comfort. The color coated denim is available in several colors, including the chocolate pair I have, licorice, chianti and vermilion. Dark feather, dark taupe, turquoise, alabaster and purple mountain are the newest colors out this month, so look out for them!